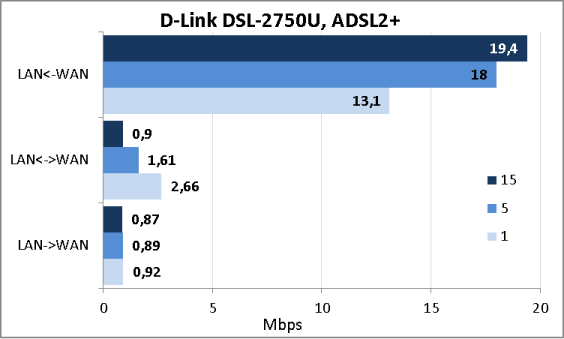 Once we already reviewed a kind of ADSL2+ modem ASUS DSL-G31 which allows connecting both to networks of ADSL operators and common Ethernet providers. 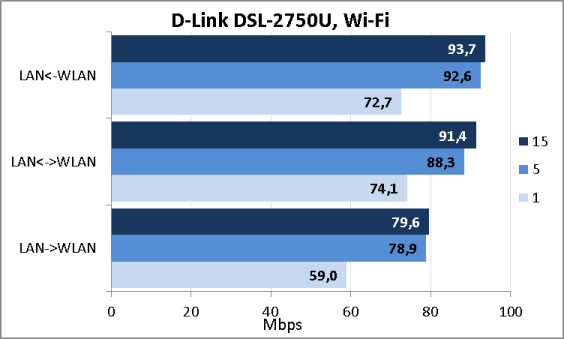 Now our laboratory hosts another router; this time it is ADSL2+ D-Link DSL-2750U. Let's see what this model is capable of. The ADSL2+ modem under review comes in a black plastic case with dimensions of 160x128x36 mm not including the non-detachable antennae. 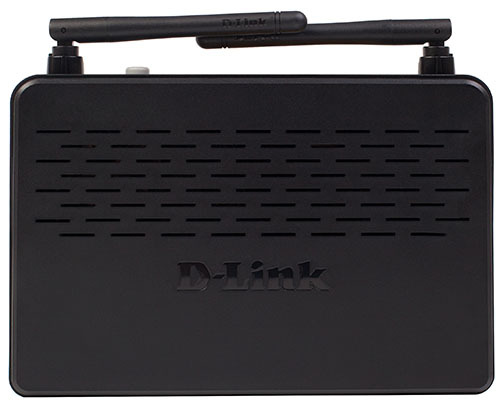 To work properly D-Link DSL-2750U needs an external power unit with the following characteristics: 12В/1А. On the front panel there are LEDs indicating status of the device (Power) and its ports (LAN 1-4, WLAN, USB, and DSL), as well as the status of WPS and provider authentication process (Internet). Side panels are not remarkable at all and there are only ventilation grates on them. The upper panel also has some ventilation holes and a 3D brand tag on it. On the bottom of DSL-2750U there are stickers with brief information about the device, four rubber legs, and two tooling holes used to mount the device on the wall. There is also a ventilation grate here, which tells us that this device probably needs enhanced cooling. Sunken Reset button is used to reset the user settings back to the factory defaults. The rear panel has four LAN ports and one DSL interface on it. Also, there is a USB2.0 port located here (which is painted the way as if it was its 3.0 counterpart), as well as external power supply socket, on/off button, WPS button, and wireless module Power button. Two non-detachable wireless antennae are located along the sides on the rear panel. 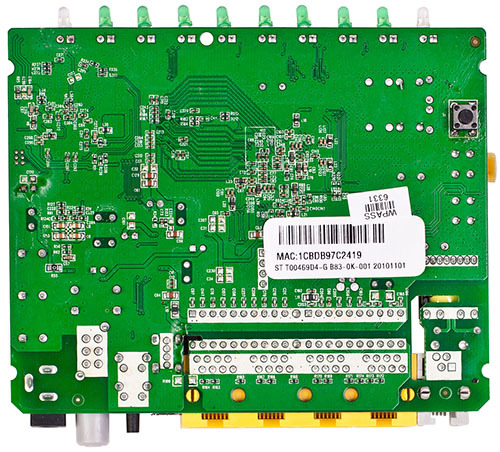 The electronic stuffing of DSL-2750U is one green textolite card which has all essential elements located on one of its sides. 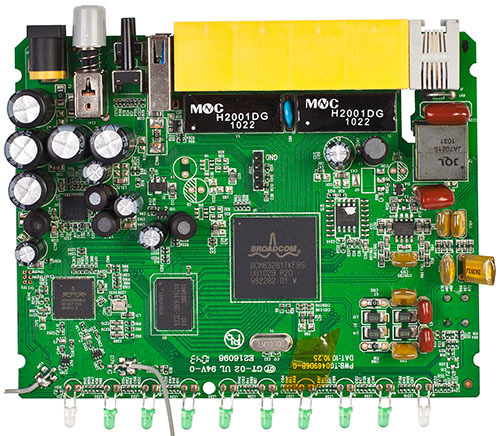 The logic component of the device is powered by a Broadcom BCM63281TKFBG chip. A BCM63281TKFBG module of the same-named brand is charged with duties regarding wireless network. A Samsung K4T56163QI chip acts as RAM. 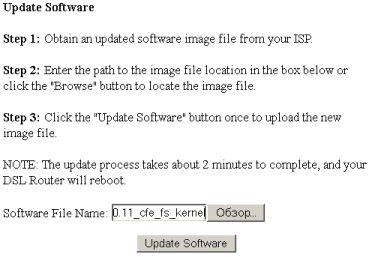 Firmware upgrade is carried out in Update Software section, Management group of the web-interface. Using Summary section, Device Info group, one can obtain information on the current firmware version. The whole procedure takes about a minute. We have updated the version from 1.00 to 1.0.11. 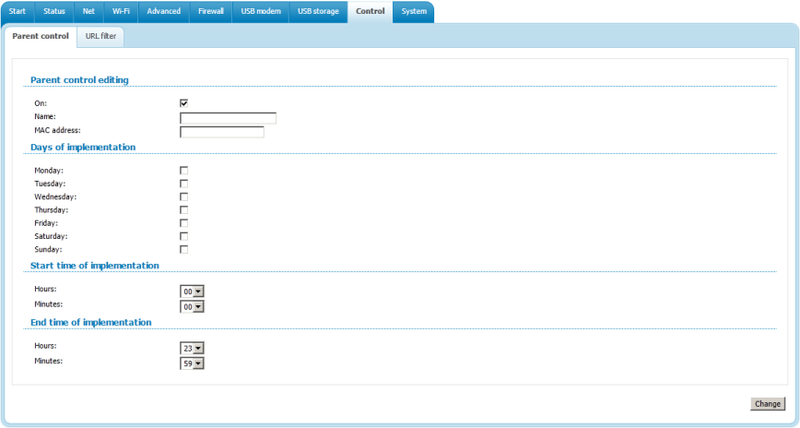 The vendor has updated the web-interface in the new firmware version. Now the upgrade process is performed in “Firmware upgrade” tab, “System” group, while information on the current firmware version can be found in “Start” group. Apart from the conventional firmware upgrade method specified above, it is also possible to upgrade the firmware in the recovery mode. 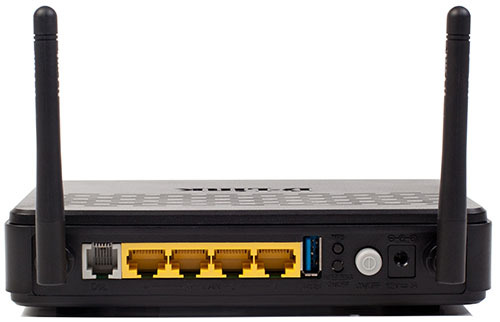 D-Link DSL-2750U switches to the emergency mode upon an unsuccessful firmware upgrade. It can also be switched to the emergency mode manually by pressing Reset button for ten seconds when the device is loading. The recovery process is easy enough; one just needs to choose a file with the new system image and click on Update Software button. That is where we bring review of the firmware upgrade process to a conclusion and pass on to examining capabilities of the device web-interface. 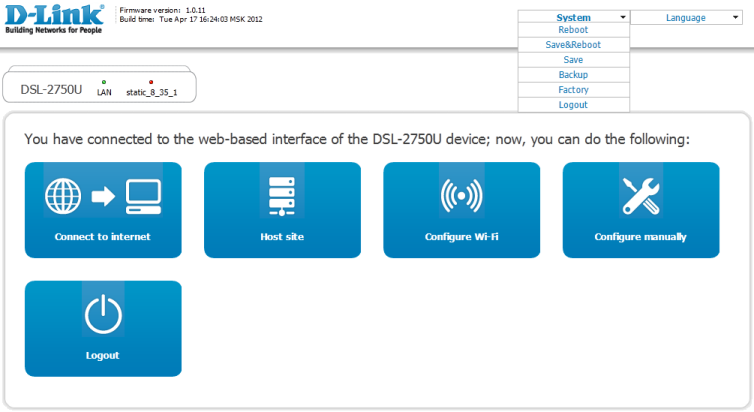 One can access the web-interface of the ADSL D-Link DSL-2750U router with any modern browser just by entering the IP address assigned to the LAN-interface. By default, it is 192.168.1.1. In order to enter it, an administrator must specify login and password, which are admin/admin by default. Web-interface is available in seven languages. Upon the successful authentication the administrator will find himself/herself on the home page of the device where he/she can manage the essential router operation parameters, backup/restore/reset the user settings, and reboot the device under review. “Configure manually” icon gets an administrator to the pages with advanced settings. Let's have a closer look at them. 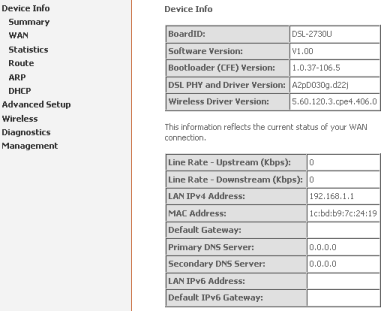 In “Start” tab the information on the firmware version, serial ID, LAN-interface address, and status of the ADSL connection are displayed. 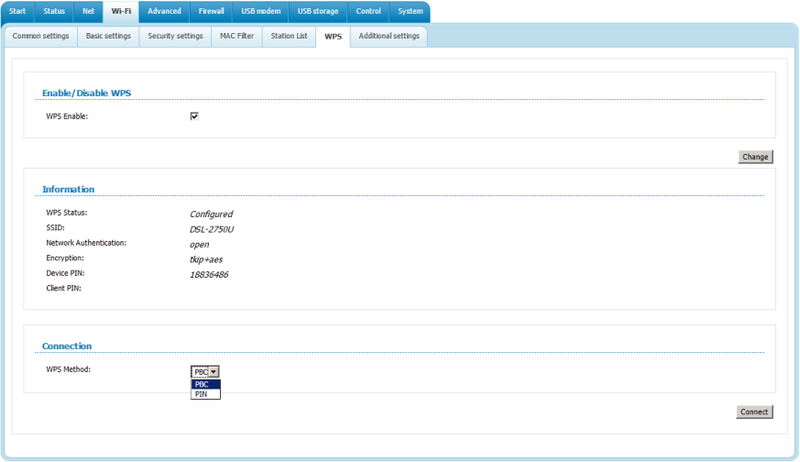 In tabs of “Status” group one can find out status of the local and DSL connections, routing table, DHCP server operation parameters, and other information. 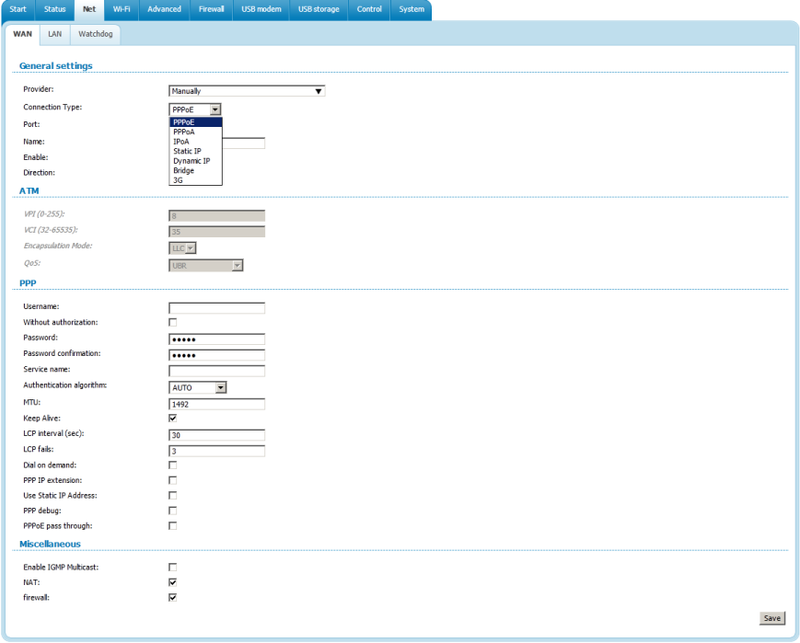 WAN tab in “Net” group allows an administrator to choose a provider or specify all connection parameters manually. Operation parameters of the device LAN-interface and DHCP server are located in “LAN” tab, the same group. 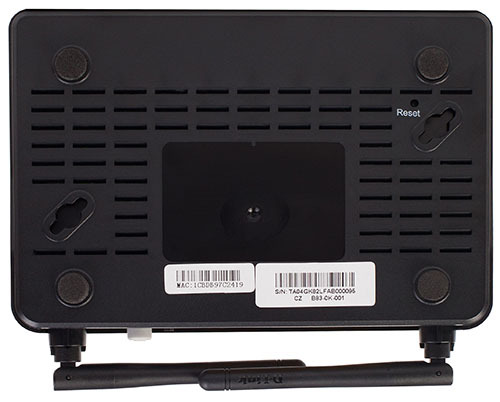 Upon a loss of connection, DSL-2750U can route the user traffic to a stand-by channel. These settings can be applied in “Watchdog” tab. 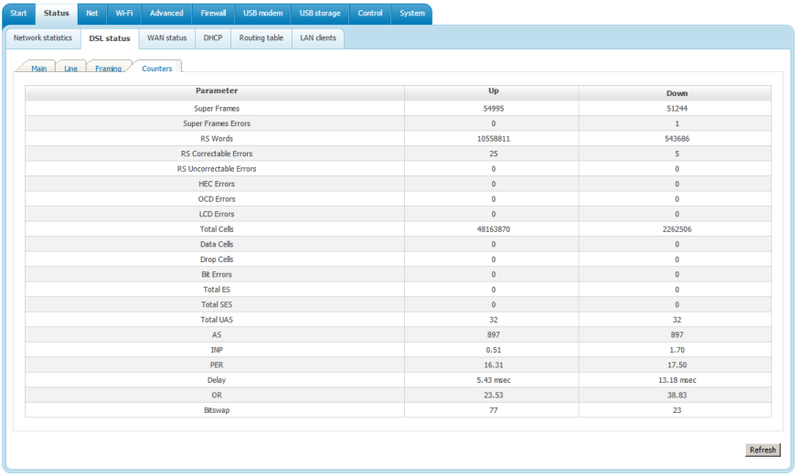 Wireless module operation parameters are located in tabs of “Wi-Fi” group. Ability to establish a guest network and choose the channel bandwidth are pretty nice options to our opinion. SNMP, UPnP, and DDNS protocol operation parameters are located in the same-named tabs in “Advanced” group. In order to connect to Triple-play services one would probably need to have interface linking to connect internal interfaces with external connections. These settings can be applied in “Interface grouping” tab. One can manage the DNS operation parameters in “DNS” tab. Wireless ADSL router D-Link DSL-2750U supports both static and dynamic routing (RIP), settings of which are made in “Routing” and “RIP” tabs. Using “ADSL” tab one can choose the telephone pair and add-ons supported. 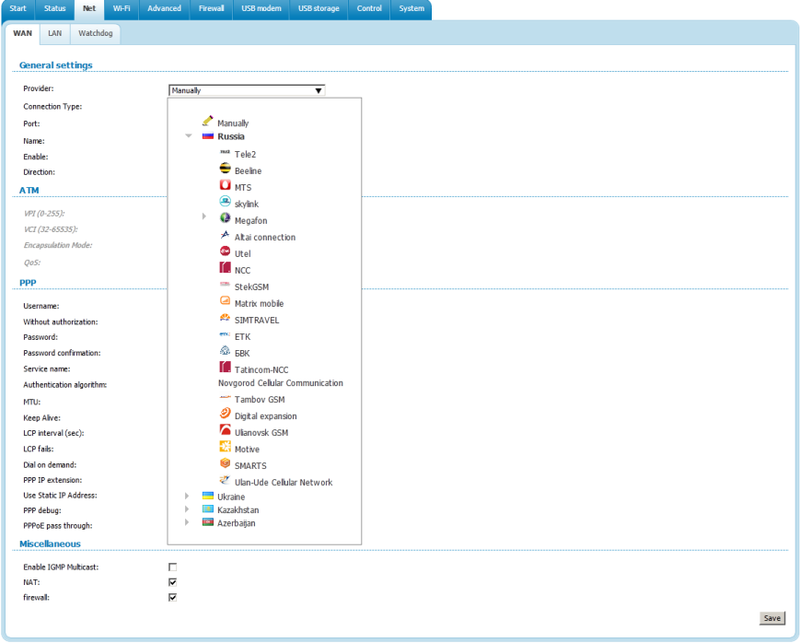 External access management is carried out by using “Remote access” tab. Alteration of the access parameters is available for the following protocols: HTTP, ICMP and Telnet. We believe that a more pliant system of settings, which also supports the SNMP, would be a reasonable addition here. Management of transmitted data filtration parameters and access settings to virtual servers located on LAN is carried out using tabs of “Firewall” group. One can connect various 3G modems, printers, or external HDDs to the device USB port. Settings of the connected units are located in “USB modem” and “USB storage” tabs. Management of access to certain web-sites on WAN is carried out using tabs in “Control” group. By using tabs in “System” group, an administrator can manage the device settings, upgrade the firmware, browse through the system log, change password, synchronize or set the time, and check the availability of remote nodes. That's where we bring the review of web-interface capabilities to a conclusion. Now let's have a look at the device command line. By default, telnet access to the device is accepted. The login and password are the same that were used while configuring the web-interface. Upon successful authentication the administrator receives brief information on the device model, firmware version, and board ID. One can receive the same info using fwversion command from /VERSION file, the process of obtaining access to which is described below. For help, type 'help' or '?'. Using CLI an administrator can upgrade the firmware, backup and restore the user settings, and perform a few other functions. By inputting ps and ifconfig commands, one can learn the processes being launched at the moment and network interface configuration parameters. In order to get acquainted with the current statuses and settings, one must use show command group. Commands create, set, and remove are used in order to create, change, set, or remove certain parameters. 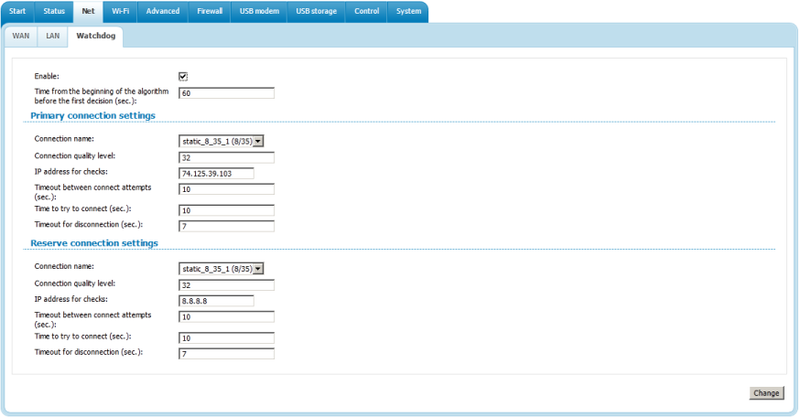 WAN and LAN interface management is to be carried out using commands of wan and lan groups. Remote access to the device and local network services is gained using vservers, raccess, dmz, and upnp commands. Management of DHCP and DDNS protocols is performed using the same-named commands. Setting wireless network parameters is done using wifi command. The commands specified above are related to the device command line and are different from the OS commands. Access to the latter is gained by inputting sh command. It is conventional to see BusyBox library used in this kind of devices, and by inputting sysinfo of the library one can get brief information on the system operation. Also, the similar information can be learnt in /proc/loadavg and /proc/uptime files. By using top utility one can obtain information on the current activity of the launched processes. Let's find out what kind of content /, /proc, /bin, /sbin, /usr/bin and /usr/sbin catalogues have. And obtain information on the CPU and RAM size. 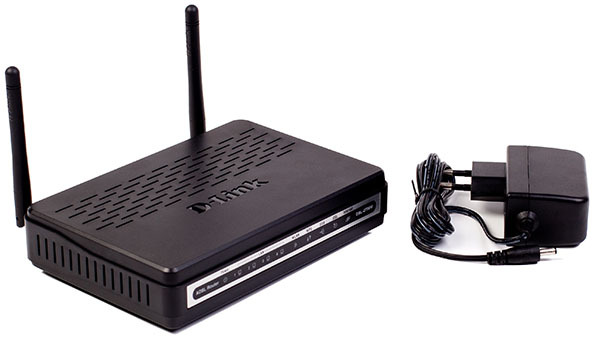 That's where we proceed to completion of the brief review of command line capabilities of the wireless ADSL D-Link DSL-2750U router and pass on to testing the device. The first testing procedure we usually begin our testing section with is estimating the booting time of the device, which is a time interval starting with the moment when the power is on until the first echo reply is received through ICMP protocol. D-Link DSL-2750U boots in 24 seconds. We believe that the result is decent. The second traditional test was a security scanning procedure, which has been carried out using Positive Technologies XSpider 7.7 (Demo build 3100) utility. On the whole, there were seven open ports discovered, and they are TCP-21 (FTP), TCP-23 (Telnet), TCP-80 (HTTP), TCP-139 (NetBIOS samba), TCP-445 (Microsoft DS), TCP-1780 (dpkeyserv) and TCP-8888 (ddi-tcp-1). The most interesting data are presented below. Now we are coming close to the most interesting part in the review, a performance test. We decided to start with evaluating user data transmission speeds in the wireless segment of the network. Results of the measurements are presented on the diagram below. Having decided not to limit ourselves only with checking the highest possible transmission speeds via ADSL, we also did measurements of several protocol standards separately. One can connect an external HDD or flash card to the USB-port of the device. 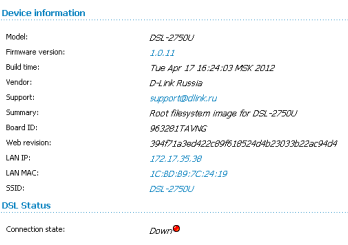 We connected an HDD which was successfully identified by the system and had its content displayed in the web-interface. However, access speeds to the user data stored on the external device were sadly surprising, to say the least of it. We were also quite surprised by the method of data transmission to the device when using FAT32 file system (there was nothing of the kind when we used NTFS). At first, upon copying a file to the flash card via network, we couldn't manage to transmit the data to the card at all, though the transmitted file appeared on the disk (and its size kept growing on and on). When the file was eventually created, the device started transmitting the data with a speed much higher than those ones specified above. That is why the figures shown above are actually average speeds we received by dividing the file size by the total downloading time (preparation time and downloading time). That's where we draw the testing chapter to a conclusion and move on to summing it all up. 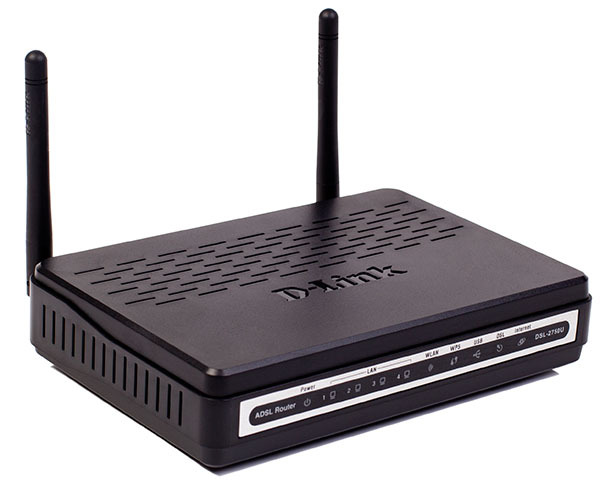 The wireless ADSL router D-Link DSL-2750U we have tested is a reliable medium-grade device which is affordable for an average user. Its capabilities and performance will be enough for majority of users. Below are the strong points of the device. 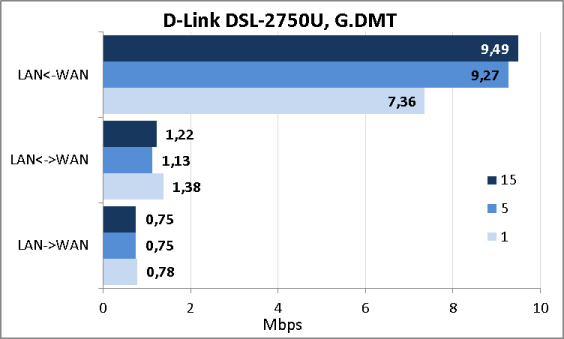 Unfortunately, we cannot help to mention certain drawbacks of DSL-2750U. As of when this article was being written, the average price for a D-Link DSL-2750U in Moscow online shops was 1500 roubles.